Materials: 14K white gold and 14K red gold; interiors of sterling silver. 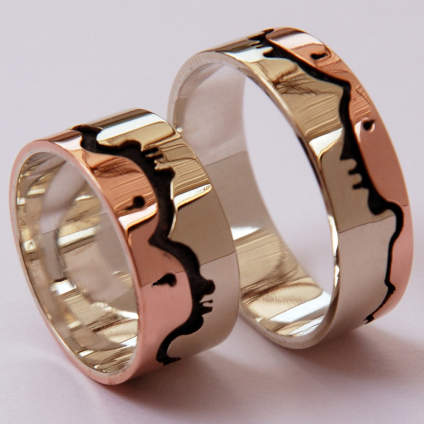 **Prices are indicative and depend on the ring sizes and the current gold price and rates of exchange. Shipping costs excluded, Dutch BTW included. 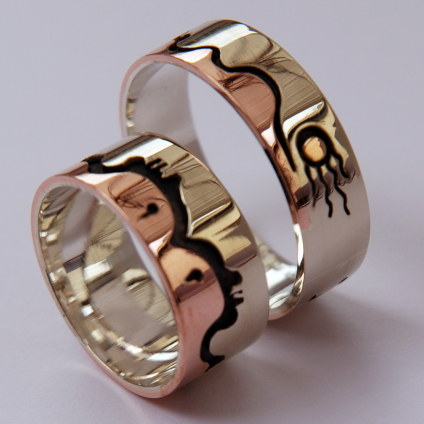 > Visit our Art Blog to read about the symbolism of the rings. 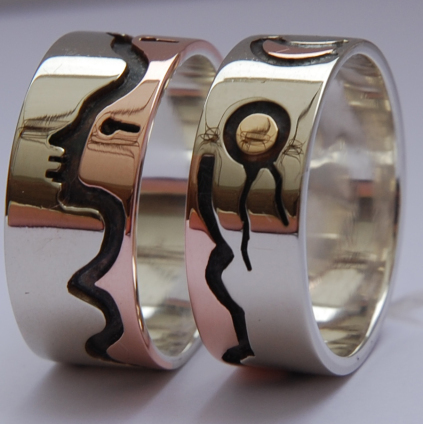 The design of the above multicolor gold wedding rings, which belong to the Mother Earth series, is reminiscent of the pictographic outline drawing style of the Medicine painters who paint in the Native Woodland School Of Art discipline. The dramatic outline of the Sleeping Giant, a rock formation that juts out on Lake Superior and forms the body of water that is Thunder Bay, is an important source of design inspiration for jeweler Zhaawano. 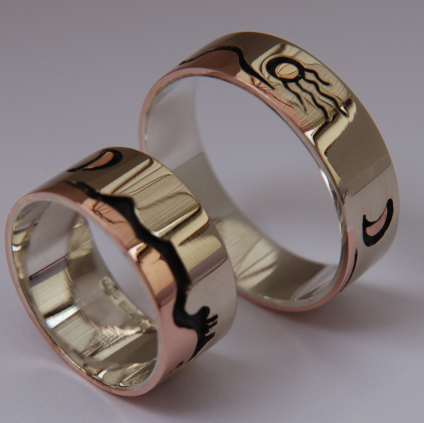 The red gold part and the oxydized (blackened) outlines of the design of these wedding rings - which he modeled after the Sleeping Giant - represent the bodies and spirits of two lovers becoming one with each other and with the Earthmother herself. From her fertile womb they sprang, and unto Mother Earth they shall return. The inlaid design elements and the circular shape of the wedding rings refer to the Anishinaabe concept of GIZHIBAA GIIZHIG, or revolving sky, which pertains to the circular movement of the planets (see the inserted illustration, a pen and ink drawing by Zhaawano). To the Anishinaabe, all knowledge and all life forms were inawendiwag, interconnected and interrelated. The term gizhibaa giizhig refers to the circular movement of the sky throughout the year, which has thirteen moons (months). In other words, the notion of "'Gizhibaa" that Zhaawano incorporated in the wedding ring design refers to the circular movement of the sun, moon, stars and seasons in Waawiyekamig, the "round lodge" - the Universe/cosmos.